It's a shame that one of the coolest SOC releases happens to be a Tamashii Nations exclusive. 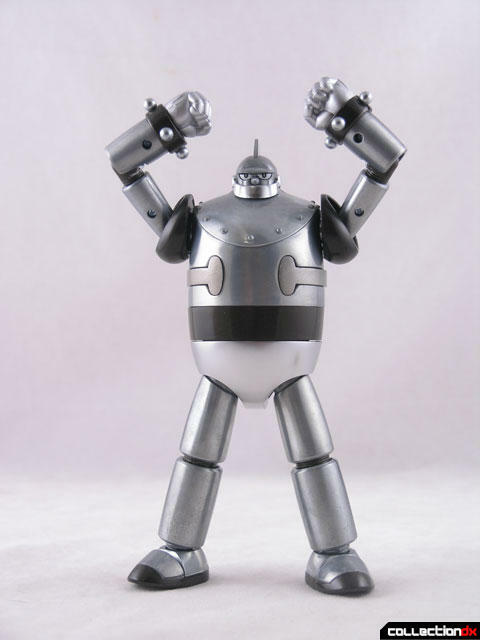 This Tetsujin 28 Naked Version was first offered as an exclusive at the Spring Tamashii Expo in Tokyo 2009, and then later at the 2009 San Diego Comic-Con. As exclusives go though, it's not particularly hard to come by. That'll bring some interesting search results. It's the same toy as the regular T-28 Soul of Chogokin, but without the paint. 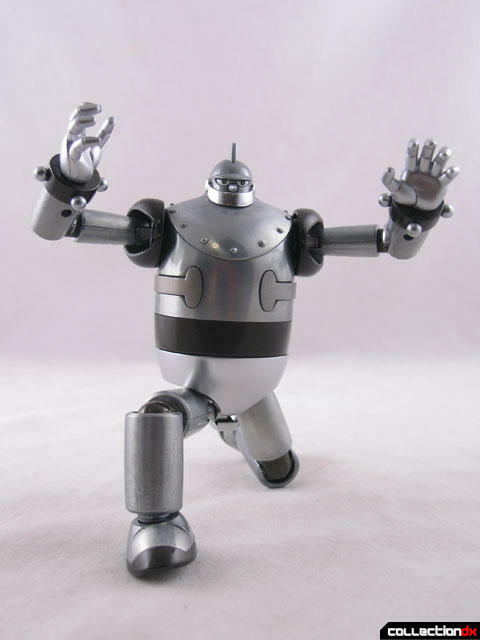 This time Tetsujin is in his birthday suit, stripped down to the bare metal. There are a few painted parts, and the plastic parts are molded in color, but this is essentially a bare bones robot. He looks damn cool. The bare metal actually appears to be polished and clear-coated. So I guess it is painted, but just not in color. 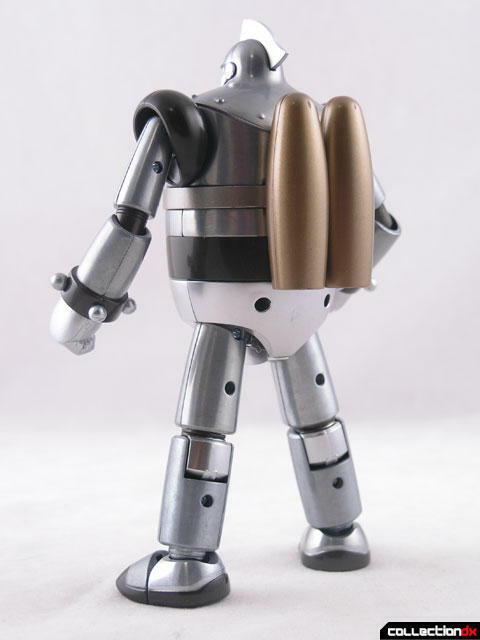 The Naked version Tetsujin is a neat gimmick, but it actually has another meaning. This black and white version is reminiscent of the way Tetsujun actually appeared in the original cartoon! How cool! 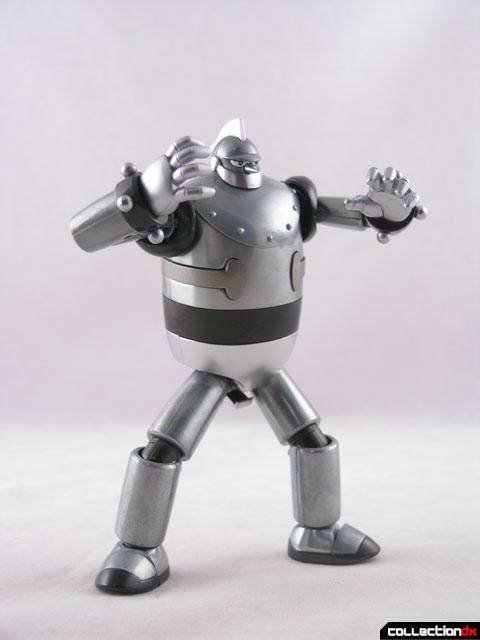 Unfortunately, being a limited edition, Tetsujin does not have all of his accessories. Excluded from this set are the Shotaro figure, the damaged arm, and the light-up gimmick. The tray gives you a little sticker telling you what you are missing out on. Still, it looks so cool that I kind of don't care, as those accessories go right back in the box. Normally I don't go for variants, but this one I like. I would love to see other SOCs 'naked'... 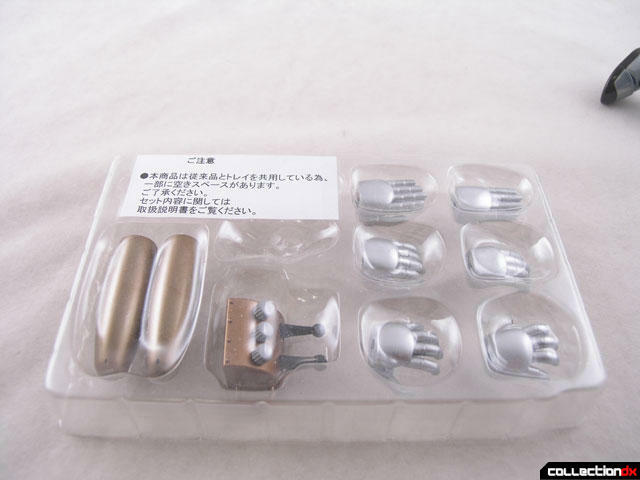 I thought it was really neat when the Shin Maz was in development and they were displaying an unpainted proto at shows... it's net to be able to see all the engineering once in a while. 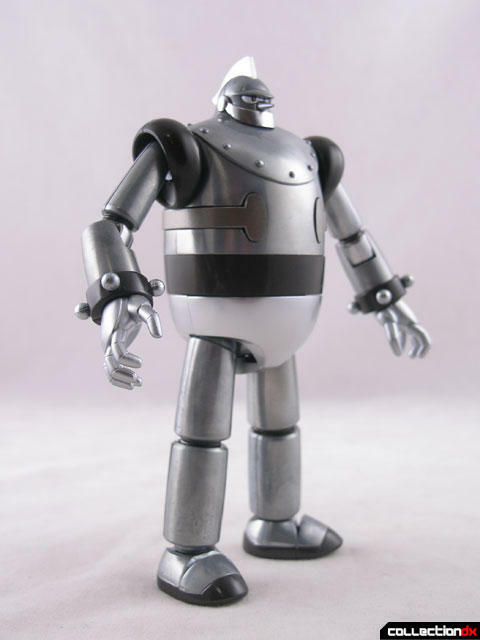 The elegant form of tetsujin's design is very stark when done in bare colors. Its beauty amazes me, and makes me reconsider a personal ban on buying more toys. I sell the old stuff off on E-Bay. Except for the favorites so I can buy new. Give it a try. Very cool toy. I was seriously considering whether to buy it or not. I really like the aesthetics of it. I'd love to see more gokin done (or not done) like this. Reminds me of the original black and white cartoon. Kinda screen accurate, right? I totally agree. It's a funny thing with this character--I only ever knew the old-school pot-bellied T28 from the black & white show (not that I really watched it, but I remember it being on in syndication). So, he was grey in my mind. 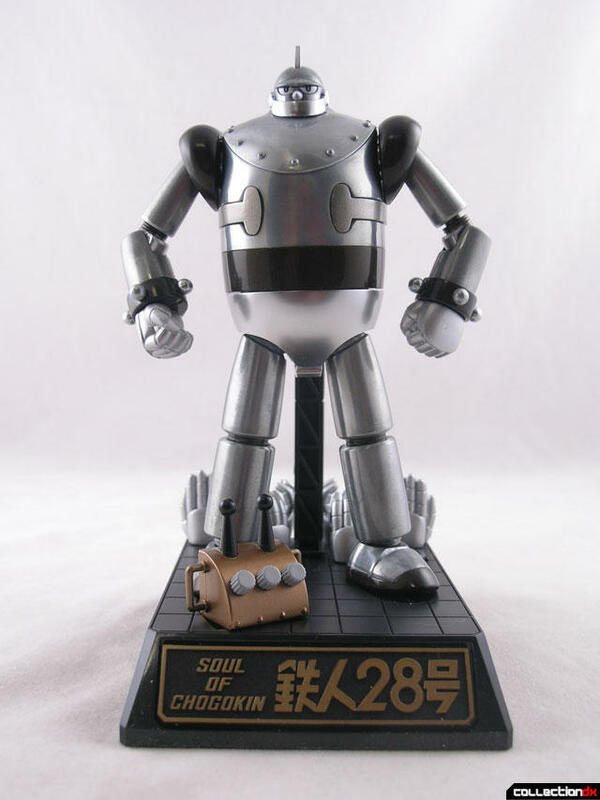 Of course, I knew Tetsujin 28 Go (the 80's T28) from the Godaikin...and he was obviously always blue in my mind. And because they had very different physiques (heh)--and because I was a dumb kid--I never made the connection between the two characters. 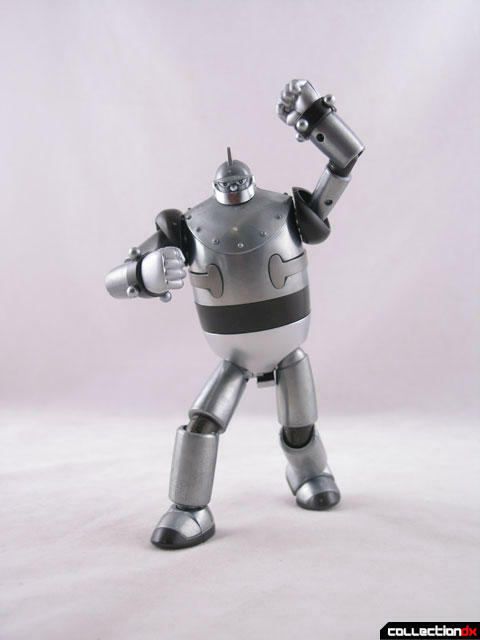 Since getting into Japanese robot toy collecting more formally in the past 10+ years, I learned that the original T28 was actually blue...and that never sat right with me. He's bare metal. He should be grey. At least, that's how my young mind resolved it! So this is the perfect pot-bellied T28 toy for me! 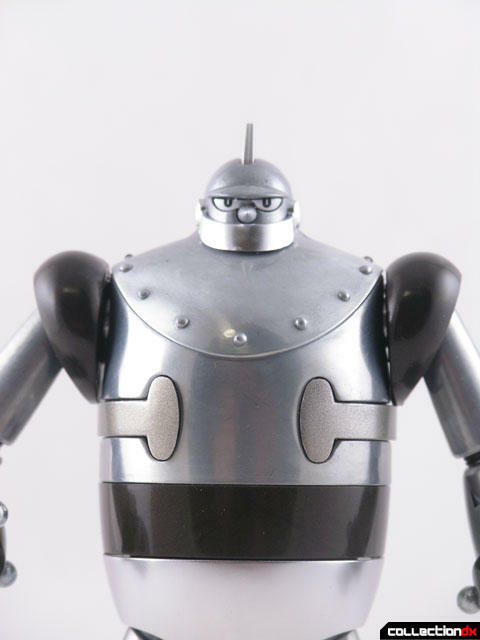 It is a shame they did leave out the other bits, but I like naked Tetsujin better than the painted version.